The rise of the internet has enabled TV to incorporate the comments and whims of their audience like never before—we’re always being invited to tweet our opinion or to like and leave comments on Facebook. But audience participation isn’t just a recent phenomenon, and game shows in particular have long made a practice of welcoming the crowd (in admittedly quainter fashion). These seven shows were all pioneers in audience participation—brave enough to give the masses some measure of control over the action. 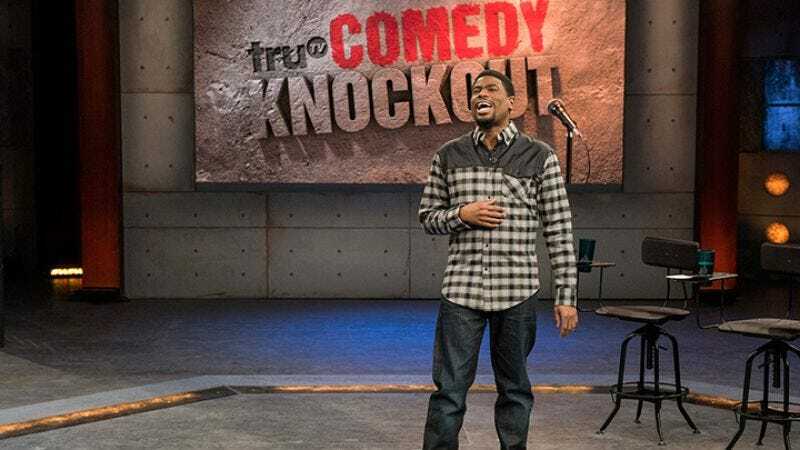 This post is sponsored by Comedy Knockout, which airs Thursdays at 10:30 p.m./9:30 p.m. Central on truTV. Anything goes when the best stand-up comedians in the country battle for comedy supremacy on this new game show where the audience determines the winner. For more, check out the official show page at trutv.com. For more than a decade, Chuck Woolery’s video-dating game show matched up couples with help from a studio audience. Singles seeking a love connection would watch three short video testimonials from potential partners and then would pick one suitor to take on a date, paid for by the show. The studio audience would vote on their choice at the same time in a secret ballot. If the date turned out to be a disaster, the contestant could get a second chance at love by spending an evening with the audience’s choice—although, of course, if the crowd made the same pick as the contestant did, everyone was out of luck. These are the risks you take when you subject your romantic life to the will of the masses. Although the title of the show focused on the brainless “is the next card higher or lower?” game that played out on Card Sharks’ big board, the real heart of the show lay in the “educated guess” questions that players answered to gain control of that board. Contestants had to answer peculiar survey questions like “We asked 100 married men, ‘Do you enjoy making your wife jealous?’—how many said yes?” In the ’80s, the show started stocking the studio audience with ready-made survey groups—for instance, inviting the players to look over 10 identical twins in the crowd and asking, “How many of these teenage twins have secretly taken a test for their twin?” With players forced to make a guess based on appearances alone, each question became a miniature experiment in snap judgment. There is no America’s Funniest Home Videos without an audience. The folks at home supplied the footage, while their surrogates in the studio risers (and some of the show’s camcorder stars) separated the lip-syncing-baby wheat from the crotch-shot chaff. The show’s original, Bob Saget-hosted incarnation put a particular emphasis on that voting process, always throwing an episode’s final commercial with a shot of the studio audience reaching for their voting devices to follow Saget’s command to “lock in your votes right now.” The voting process even got its own, “ticking clock” theme song. When CBS poached the idea for Match Game from NBC, it created one of the best game shows of the ’70s. The game’s premise: After being posed an open-ended fill-in-the-blank question, a contestant tries to match the answers provided by a six-celebrity panel. While the questions began as innocuous things like, “Name a brand of cereal,” the game quickly turned into a funny and innuendo-laden carnival, with questions such as, “Johnny always puts butter on his ____.” The audience played a key role, as their cheers or boos often foreshadowed the success of an answer. And host Gene Rayburn played to the crowd, often commenting on their reactions. But It was the Audience Match round that really brought the spectators into the game, as the winning player attempted to match the top answer given in a survey of the previous audience. Much like The Price Is Right, Let’s Make A Deal is a pinnacle of audience participation, taking its contestants directly from the assembled crowd. The difference is that on Price, audience members are more or less expected to look like regular people (Price-themed T-shirts notwithstanding), while on Deal, everyone dresses up in crazy costumes to catch the attention of the host. The chosen ones are invited to “make a deal” with the host—Monty Hall in most 20th-century incarnations of the show, Wayne Brady on the current version. Another Deal-specific touch is the possibility for audience members to get “Zonked” with a ridiculous prize, like a live animal or 50 gallons of orange juice. But Let’s Make A Deal isn’t a monster. These “winners” can exchange their Zonk prizes for cash after the show. Thank goodness for that—flying home with a live cow never makes the flight attendants happy. Though Who Wants To Be A Millionaire? upped the primetime quiz show ante with its big-time prize money, it also lent contestants a few helping hands. Or a few dozen, in the case of the show’s “Ask The Audience” lifeline. With tremendous riches on the line, Millionaire contestants get one chance to ask the shadowy strangers in the stands for help winnowing down a multiple-choice question to the correct answer. It’s a trivia sweepstakes by way of vox populi, even if the wisdom of crowds doesn’t always prevail: The show’s been on long enough (and in enough countries) to fill entire YouTube playlists with contestants who got the right answer from the audience but still made the wrong choice. Like most short-form improv shows, Whose Line often relied on suggestions from the audience to provide inspiration for its scenes. But a few of the series’ many games incorporated members of the audience more directly, like “Musical,” in which the performers brought a spectator onstage to be the subject of an improvised Broadway musical, or “Moving People,” in which the improvisers perform a scene but can only change position when they’re manually moved by audience volunteers. The people from the crowd weren’t expected to have the comic chops of the cast members—rather, their general awkwardness and confusion was the fuel for the comedy. Watch the country’s best stand-ups battle for comedy supremacy – with the audience deciding the winner and loser – on COMEDY KNOCKOUT, Thursdays at 10:30/9:30C on truTV.